eorge Washington was a daring soldier himself and of course noticed how other men behaved on a battlefield. He liked a man who had plenty of courage--a real hero. There was a certain Colonel Prescott who fought at the battle of Bunker Hill whom Washington admired. He always spoke of him as Prescott, the brave. Colonel Prescott had a grandson, William Hickling Prescott, who was never in a battle in his life and did not know the least thing about soldiering, but he deserved the same title his grandfather won--"Prescott, the brave"--as you will see. William was born in Salem, in 1796. His father, a lawyer who afterwards became a famous judge, was a rich man, so William and his younger brothers and sisters had a beautiful home; and as his mother was a laughing, joyous woman, the little Prescotts had a happy childhood. William was much petted by his parents. His mother taught him to read and write, but when he was very small he went to school to a lady who loved her pupils so well that she never allowed people to call her a school-teacher--she said she was a school-mother. Between his pleasant study hours with Miss Higginson, this school-mother, and his merry play hours at home, the days were never quite long enough for William. When he was seven, he was placed in a private school taught by Master Knapp. And there he was asked to study rather more than he liked. He had loved story books almost from his cradle, and what he read was very real to him. Sometimes, when he was only a tiny boy, he felt so sure the goblins, fairies, and giants of which he had been reading might suddenly appear, unless his mother were at hand to banish them, that he would follow her from room to room, holding on to her gown. Still these books were much nicer, he thought, than the ones Master Knapp told him to study. He was full of fun and frolic and took all Master Knapp's rebukes so cheerfully that the teacher could not get angry with him. His schoolmates adored him. Even if he did play a good many jokes on them, they were not mean, vicious jokes. He had altogether too kind a heart to hurt a person or to say unkind things. He did manage to get his history lessons, and he liked to read lives of great men. But he did not study any great amount until after his father moved to Boston, and William began to fit himself for Harvard College. He was proud of his father and fancied that he would like to be a lawyer like him. 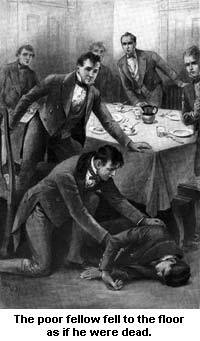 Young Prescott had been in college but a short time when, one night at dinner, a rough, rude student hurled a hard crust of bread across the table, not aiming at any one in particular. But it hit Prescott in his left eye and destroyed the sight in it. The poor fellow fell to the floor as if he were dead and was very ill for weeks. Then it was that he began to earn his title of Prescott, the brave. He did not complain, he did not say: "Well, of course, I shall never try to do anything now that I have only one eye to use." Instead, he kept up his spirits and finished his course at Harvard gayly. Everybody talked of his pluck. He was asked to be orator of his class, and he wrote for graduation day a Latin poem on Hope, which he recited with such a happy face and manner that the people clapped their hands and cheered. His parents were so pleased that William could finish his college work, in spite of his accident, and that he could keep right on being a rollicking, laughing boy, that they spread a great tent on the college grounds and feasted five hundred friends who had come to see William graduate. Then William went on a wonderful visit to the Azores. His mother's brother, Thomas Hickling, was United States Consul at St. Michael. This uncle had married a Portuguese lady, and there was a large family of cousins to entertain the New England boy. Mr. Hickling had a big country house and a lot of spirited horses. As William drove over the lovely island, he used to laugh at the funny little burros the working people rode and the strange costumes they wore. Of course, he found St. Michael a different looking place from Boston, with its brick, or sober-colored houses. At the Azores, you know, everything is bright and gay. A salmon-pink castle stands next a square, box-like house, painted yellow; a blue villa and a buff villa probably adjoin dainty green and lavender cottages, and occasionally a fancy little dwelling, all towers and balconies, will be painted cherry red. Then the mountain peaks behind all these houses are vivid green. So William felt almost as if he were in fairyland. When he had been looking at these beautiful things about six weeks, he found suddenly, one morning, that they had turned black. He could not see a bit with his well eye! A doctor was sent for and he said: "A perfectly dark room for you, William Prescott, for three months, and only enough food to keep you alive!" In all the ninety-five days the doctor kept him shut in, William was never heard to utter one word of complaint. His cousins sat with him a good deal (thankful that he could not see them cry), and he told them funny stories, sang songs, and paced back and forth for exercise, with his elbows held way out at his sides to avoid running into the furniture. He finally saw again but had to be very careful of that one useful eye all the rest of his life. The minute he used it too much, the blindness would come on again. As studying law was out of the question for him, he thought he would write histories. He had already learned a good deal about the different countries but knew most about Spain. So he set about learning all he could of that country as far back as the days of Christopher Columbus. Of course, this brought in King Ferdinand and Queen Isabella (you remember she offered to sell her jewels to help Columbus) and stories of Peru and Mexico, so that William Prescott spent most of his life gathering facts together about the Spanish people. And the histories of them he wrote (eight large books) sound almost like story books; when you read them you seem to see the banquet halls, the queens followed by their pages and ladies-in-waiting, the priests chanting hymns in their monasteries, and the Mexican generals in their showy uniforms. Think how hard it was for William Prescott to make these histories. He dared use his eye but a few hours a week. So he hired people to read to him, to go to libraries to look at old papers and letters, and to copy the notes he made on a queer machine. You can see this instrument that he contrived at the Massachusetts Historical Society. Some pieces of wood held sheets of paper in place; other strips of wood kept the pencil going in fairly straight lines. But sometimes when he used this at night, or when his eye was bandaged, he would forget to put in a fresh sheet of paper and would scribble ahead for a long time, writing the same lines over and across until his secretaries would have a hard time to find out what he meant. He did not want to waste time by asking to have the same thing read twice to him, so he trained his memory until he could carry the exact words on a page in his mind, and after a while he could repeat whole chapters without a mistake. But it was slow work making books this way. He was ten years getting his first one, the history of Ferdinand and Isabella, ready for the publisher. Prescott did not talk about this work. No one but his parents and the secretaries knew that he was busy at all, because in his resting hours he was often seen at balls and parties, laughing and chatting in his own lively way. And one day one of his relatives drew him aside (this was when he had been grinding away in his library for eight years) and said: "William, it seems to me you are wasting your time sadly. Why don't you stop being so idle and try some kind of work?" This same relation and all Prescott's friends were astonished and proud enough when, two years later, three big volumes of Spanish history were for sale in the book-stores, with William Hickling Prescott's name given as the author. That season every one who could afford it gave their friends a Christmas present of the Prescott books. He had compliments enough to turn his head, but he was too sensible to be vain. He wrote several other books and soon became famous. When he was in London, he had many honors shown him. Prescott was fond of children and always kept a stock of candy and sweets on hand for small people. His servants adored him and so did his secretaries. They used to tell how he would frolic, even at his work. Sometimes when he had got to a place in one of the books where he must describe a battle scene, he would dash about the room, singing at the top of his lungs some stirring ballad like: "Oh, give me but my Arab steed!" And then when he felt he really "had his steam up" he would begin to write. He was kind and generous and showed so much courtesy to rich and poor alike that he has been called the finest gentleman of his time. No doubt he was, but it is true, too, that he was Prescott, the Brave!